I gave into peer pressure with this one... Okay okay I saw alot of a few You Tubers and bloggers talk about the Bumble & Bumble Surf Foam Wash shampoo and decided to go ahead and get the full size version. I did see the Surf Set and liked the idea of trying both the shampoo and conditioner but I knew I wouldn't use the Surf Spray so I opted to buy the full sized shampoo only. 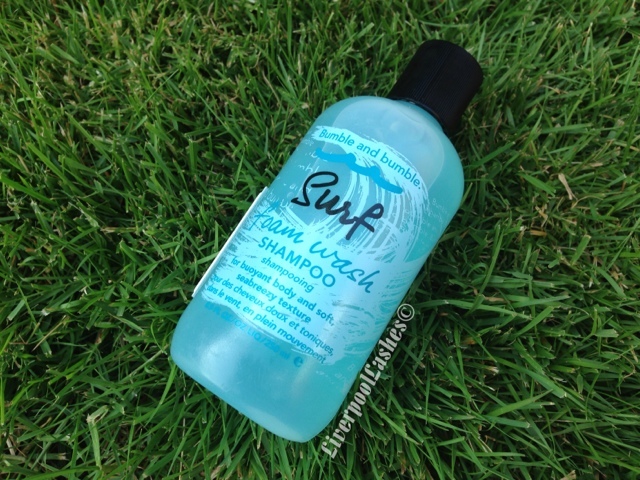 "This Surf Foam Wash Shampoo can help you gain luscious locks in just one wash featuring a clean-rinsing formula that helps to wipe out impurities and makes way for bouyant body and soft sea breezy textures." The scent of this shampoo is gorgeous - think clean linen mixed with an ocean / beach type fragrance. A little goes a long way and it lathers up quickly. I felt like as soon as I rinsed my hair I could tell it definitely felt soft, even though I only applied my regular conditioner to the tips of my hair. My hair seemed to dry alot faster too with more volume with the lingering scent. I also felt that although my hair was soft it felt almost like it had a little texture in it which meant it was alot easier to style. I think the best way I can describe this experience is close to feeling like you just washed your hair in a beautiful crystal clear ocean. The bottom line is.. I love this shampoo. At £18.50 for a 250ml bottle its pretty pricey but you really dont need alot, I rotate my shampoos so that my hair doesn't get used to one brand and I can foreseen that when I finally do run out of it that I shall be repurchasing it. This sounds lovely. I think they are giving something from this brand away in Elle and I was very tempted to get it! I have heard so much about the surf collection, and it is definitely on my most wanted list.